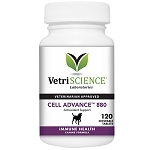 Home > Misc > See All Products > See All Dog Products > Antioxidants for Dogs > VetriScience Cell Advance 440 - Antioxidants for Cats & Small Dogs - 60 ct. Cell Advance 440 is an antioxidant supplement for cats and small dogs with allergies, respiratory problems, skin disorders and other conditions associated with aging. 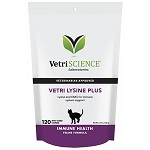 Cell Advance 440 by VetriScience - Antioxidant for Small Dogs and Cats. Quercetin, rutin and hesperidin are bioflavonoids with strong antioxidant properties and help promote healthy circulation, maintain collagen, and block the release of histamines to help pets with allergies. Four types of amino acids to support cellular respiration, antibody production and antioxidant activity. Cell Advance 440 is recommended to help support the immune system and can be beneficial for dogs and cats with allergies, respiratory problems, skin disorders and many conditions associated with aging. 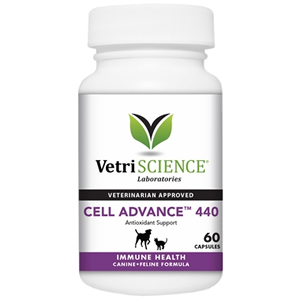 Cell Advance 440 contains 60 capsules and is for small dogs and cats. For medium to large dogs, see Cell Advance 880. This is a very good supplement introduced by my vet when my dog went through a tibia repair. Enteric-coated: Coated with a material that permits transit through the stomach to the small intestine before the medication is released. The term "enteric" means "of or relating to the small intestine." Inactive Ingredients: gelatin, cellulose, magnesium oxide, vegetable leucine. Give 1 capsule daily, per 10 lbs of body weight. If giving more than 1 capsule daily, divide between AM and PM. See the section on Antioxidants for more information on how antioxidants can be beneficial for your pet.